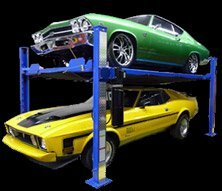 There’s no question the Lift King lift is superb…..but what sets my experience apart from many others is the customer service that Ross provides….exceptional, above and beyond expectations….every time. A real rarity. Don’t hesitate to purchase anything from Lift King….Ross will take care of you! Hey guys , thanks for all your help! i just got my lift together and it’s amazing ! As soon as I can talk my wife into it i’ll be ordering another one!! Great service, thanks alot for all your help! I can finally park my truck inside!!! Outstanding ! I couldn’t believe the quality of my lift! I have seen all the others for sale before I chose yours, Quality is the difference! Wow Wow Wow , thats all I have to say… Wow , Thanks Guy’s your great! My husband was Floored!! I have to say , The best xmas present ever! He Loves his new toy! Only The Best for my New FERARRI!! I HAVE PURCHASED 28 LIFTS FOR MY COLLECTION, FROM ROSS, HE IS A CLASS ACT! AND HIS PRICE AND QUALITY CANNOT BE MATCHED! Unbelievable service! it seems you dont see a lot of that anymore ! it’s refreshing too see it!I will be back!! Top Notch, everything was Great, No more cold concrete floors for me! I searched for a long time for a lift, did my research and I know I made the right decision. Thank you for all the help and thanks for a quality product! I will tell everyone I know. Ross….here’s our cars on the new lift…works great in this small area….thks again….